Vice President of University Advancement Pat Vickerman speaks with a Redbird at move-in 2017. 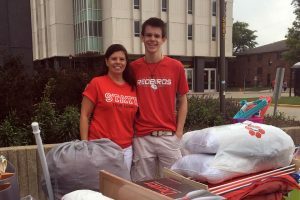 Move-in is the time that campus comes to life as students get settled into their residence halls before starting the fall semester at Illinois State. 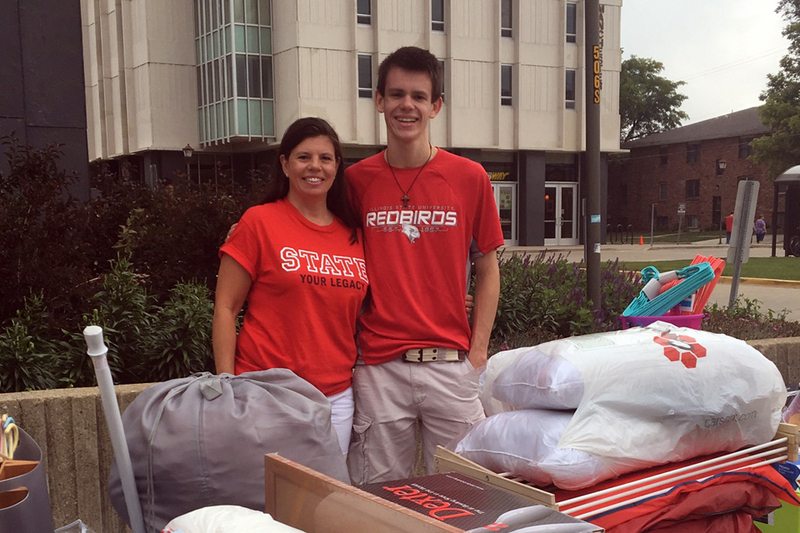 As students and their families are prepping for the trip to campus, areas of campus are prepping some extra Redbird pride experiences for their return. Redbird legacy family Leah ’88, M.S. ’92, and Aidan Walton stand outside Hewett and Manchester Halls during move-in. The Alumni Association is excited to welcome new Redbirds to the family, especially those a part of a Redbird legacy family. As a part of move-in 2018, legacy families are invited to take a break from the unpacking or stop in for a quick pick-me-up with a visit to the Redbird Legacy Lounges. Mornings will feature doughnuts and coffee, and in the afternoons, cookies and lemonade/ice tea/water will be served along with a couple giveaways just for Redbird legacies. Watterson Tower residents can stop by Hewett/Manchester Halls’ lounge too. Hewett/Manchester, Escalante Room: 8–11 a.m. and 1–3 p.m.
Tri-Towers, Shawnee Room: 8–11 a.m. The Illinois State Redbird Pride committee and the Division of Student Affairs will be spreading Redbird spirit with the help of volunteers. How so? As families work through the car line to begin unloading, they will be greeted with a special giveaway to showcase, just that, a little more Redbird spirit! The committee and Student Affairs are also seeking alumni volunteers to help with the giveaways during the below times. Shift times: 7:30–9:30 a.m., 9:30–11:30 a.m., 12:30–2:30 p.m., 2:30–4:30 p.m.